I bought a cast iron Lodge Logic Dutch Oven from Amazon for $19.98. So eager to try out its heat retention capabilities, I decided to make pho ga (Vietnamese chicken noodle soup). I like my broth with lots of flavor from the spices so adjust yours accordingly. 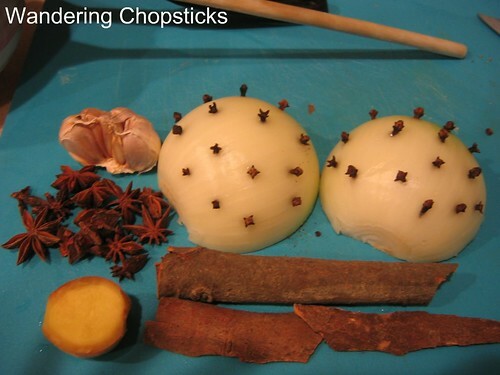 Ingredients include cloves (studded into an onion), cinnamon, star anise, ginger, and garlic. 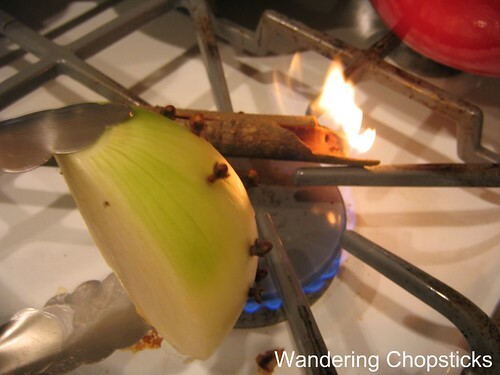 Then using a pair of tongs, char each item over a gas burner. The charring brings out the aroma in the spices. If you don't have a gas stove, then dry-fry the spices in a pan with no oil to release their fragrance. You may wish to put the spices into a cheesecloth for easy removal. It also keeps the spices from falling apart in the broth. I use a slotted spoon to scoop out the spices later and don't mind small bits. (That's code for I'm too cheap and lazy to buy cheesecloth for the rare instances when I decide to make pho.) I just toss the charred spices into the pot with the boiling chicken. Add 2 tsp salt, lightly cover the pot, and turn the heat to medium-low so the chicken simmers for about half an hour to 45 minutes. Too long and the chicken will become mushy. Make sure to turn the chicken halfway through so that both sides are fully cooked. 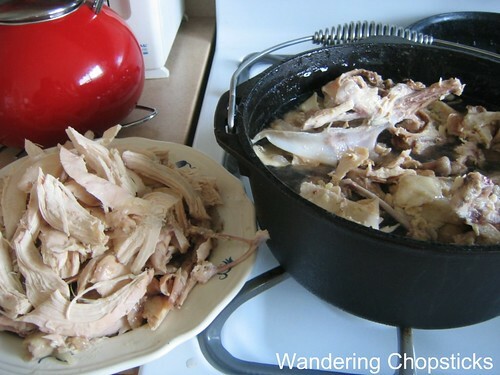 Remove the chicken and shred into large chunks. Cover so the chicken doesn't dry out and set aside. Transfer the bones back into the pot. Let the stock come to a boil again. Then turn it down to medium-low and let it simmer again for another hour or two. When you decide you're ready to eat, take a slotted spoon and scoop out all the bones and spices until the broth is clean of any debris. If you want to do this overnight, then turn off the pot and let it cool and refrigerate. The next morning, fat and any leftover impurities will have solidified and risen to the surface of the pot. Remove with a skimming spoon, or by dragging plastic wrap across the surface. Refrigerating it makes for easier removal of impurities and a much cleaner broth. When you're ready to eat, taste and add fish sauce if necessary. Then add the chicken back into the pot to let it warm up. 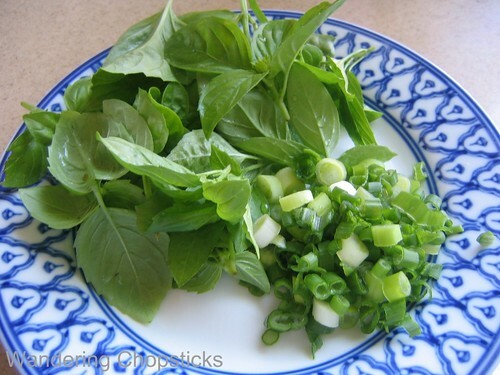 Prepare the herb platter with basil and chopped scallions. Normally, I'd use Thai basil, but I had Italian basil in my garden. While your broth is simmering, you can boil water for the pho noodles. Pho comes fresh or in dried packages. My trick is to upend a rice bowl into the colander. 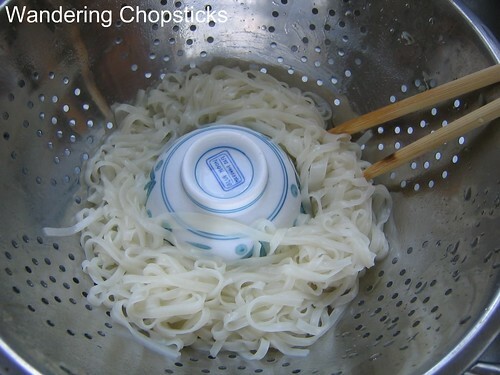 This minimizes the area the hot noodles would be poured into, thus helping to prevent clumping. Now, when ready to eat, turn up the heat again so the broth is boiling. My grandma always said to use the biggest bowl you have, even if you don't plan to eat that much pho, because the bigger bowl will help retain the heat and keep your pho piping hot. This is more important with beef pho since the larger bowl will hold more boiling broth, thus cooking the raw beef. Not so important for chicken pho, but it's still nicer to have room for added condiments and herbs. 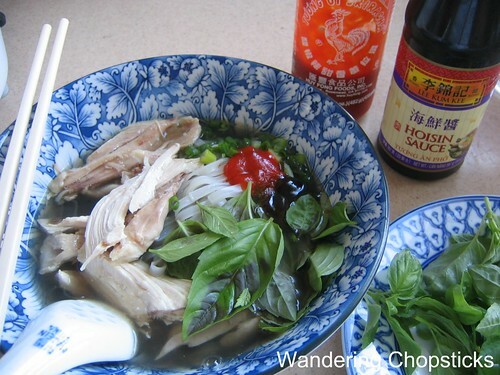 To assemble your pho bowl, start with noodles, add the meat on top, then ladle in the boiling broth. Condiments are usually Sriracha chili sauce and hoisin sauce. Then squeeze a quarter section of lime, add bean sprouts, basil, green onions, and sawtooth herb if you're lucky enough to have any. My verdict? I still prefer pho bo, but it's not so bad for a first attempt at pho ga. The broth wasn't as clear as I'd like. That's mainly because of the cast iron stock pot and because I bought some cinnamon bark at the Vietnamese grocery store that seems to darken the broth a whole lot more than the cinnamon sticks I usually get at the American grocery stores. Not a problem when making beef pho, but seems a bit too dark for chicken pho. I wanted to update this post with better pictures so I invited some friends over for dinner. Unfortunately, I got home from work late, so it took a little longer to get food on the table. I wasn't in the mood for setting up photos and figured I'd leave the post as is. Luckily, WeezerMonkey took plenty of photos and graciously allowed me to use them. So all photos below are courtesy of her. Sawtooth herb on the left, Thai basil on the right. 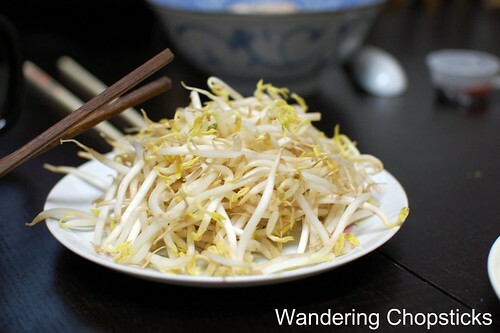 She even made the bean sprouts look pretty! I'm not a purist. 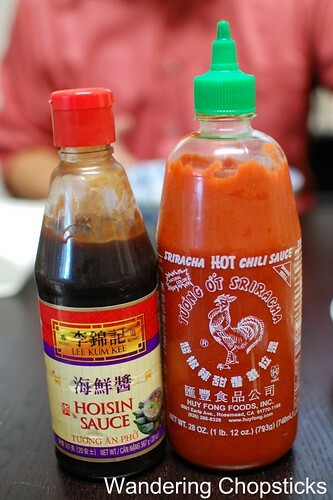 I like both hoisin and Sriracha chili sauce in my pho. Now, wouldn't you all agree that these photos livened up this old post? 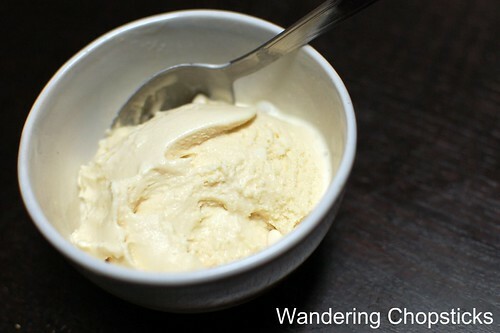 We finished off dinner with Tony of SinoSoul's freshly churned Bailey's ice cream. i came across your site through foodgawker today. commented in the Soda Xi Muoi, and avacado shake area. I am allergic to beef and our only market that carries anything vietnamese only carries pho bo boullion. The only store that could closely make the pho I'm accustomed to has closed down, so reading what the other ingredients are as well as the preperation of them is so exciting to me! I've made this at home before (scallions, cilantro, mung beans, jalapenos, and thai basil, red chili sauce, fish sauce, and hoisin sauce is what I typically use with mine), but it never tasted complete. So thank you for sharing this!!! I hear the vietnamese saigon cinnamon is a purer cinnamon and I haven't looked for it yet in my area but I heard it was more expensive AND harder to find... do you notice a difference if you use store brand cinnam as opposed to vietnamese cinnamon? I made this several days ago and didn't follow your instructions as well as I followed your pictures and it came out exactly as I and my whole family thought pho ga should! I am so used to salty broths and so I thought it was a little bland. But once all the accoutrements were added as I like it - it was PERFECT. OMG. I wanted to make more the next day (but need to go get more chicken)! And I think this is going to be a weekly staple in the house. Thank you for being so generous and sharing with us all! I've used regular store cinnamon many times and haven't had any problems. Don't stress about finding Vietnamese cinnamon. I'm so glad everything turned out great for you. Yay! Yay! I always like hearing that. Thanks for the recipe! My husband is Vietnamese and I am always trying to make stuff he likes. This recipe was an authentic hit! Yay! Thanks for letting me know. I love hearing when someone likes a recipe. My friend is Vietnamese and he makes this soup, when he does he always gives me some cause I love it, but he won't tell me how he makes it and reading this I can see why. there's a lot of steps involved...no wonder he wouldn't tell me. That or he likes that he can make me something I love. I want to make this but, where I live the only place to shop for Asian things is Walmart and I don't think they will have some of this there. went to new Vietnamese restaurant in our town on Friday and had Pho Ga for the first time; everyone had been saying it was so good. We really liked it. I came home and looked for a recipe to make my own and came upon yours. I made it today and it tastes EXACTLY like what we had at the restaurant. In fact, it maybe was a little better as my chicken was more flavorful; theirs didn't taste like it had been cooked in the broth. I did not char the spices but still found it great. Thank you so much! I think he likes making something you love, and being the one to provide that for you. :) Walmart has fish sauce for sure. And the spices are pretty common. Awesome! Don't you love when you can recreate a dish for yourself? is there a reason there are no coriander seeds in this recipe? does it throw out the balance in flavor? roughly how much water did you use? You can add coriander seeds if you want. Sometimes I do, sometimes I don't. I don't think it adds much to the flavor actually since the other spices are stronger. It's a 5-quart pot, minus however much the chicken takes up, so probably at least 2 to 3 quarts of water. I am a huge fan of pho, and always find myself craving it. I decided to try and make it, but didn't think it would A: be easy B:taste soooo goood!!! Thank you so much for the recipe! I am so happy I tried it! it tasted just like my favorite Pho restaurant makes it! It's not so hard, just a bit of work, but so worth it in the end. So glad you liked it! is it ok not to refrigerate over night? Part of the refrigeration is to remove excess fat, but I wouldn't leave broth sitting out overnight because it might go bad. Breeding ground for bacteria and all that. I know in SoCal, because of the warm weather, food goes bad fast. Aww, thanks! What a cheerful little picture you described. Hope your roommates enjoyed it! I would suggest bean thread vermicelli noodles if you can get that. Regular Italian pasta noodles are too heavy for this broth. I love cinnamon and do think it's one of the important flavor profiles in this soup. Must be whole sticks though, not powder. We "discovered" pho about 6 months ago when I saw it referenced in a book I was reading. I looked it up and decided to make it using beef bones and it came excellent. Most of the recipes I've seen before have you go thru all this rigmarole to make the soup which unfortunately scares off a lot of inexperienced cooks. Fortunately I don't fall into that category. The pho bo I made was delicious! Because we like poultry more than beef I later made pho ga. I keep a large quantity of chicken stock on hand so basically all I had to do was heat the stock and season it. I season my stock to taste with 5 spice powder and black vinegar after I add my veggies. It distresses me to see recipes that require you to buy the pho spice packet since it is totally unnecessary. One can create their own with spices tied in cheese cloth if necessary. When I serve pho I serve it with broad rice noodle and either meat or tofu. I usually marinate the tofu in the stock for 2 to 3 days before making the dish so essentially the tofu ends up tasting like very tender breast meat. ;-) Fortunately there is an Asian grocer near us so I have no problem getting the noodles I like. 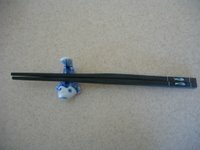 I found your site while searching for nuoc mau dua uses to give me some ideas how to incorporate it into my repertoire. (thank you, btw) Just for a lark I checked out your pho recipe and found it to be one of the better ones available online. It is doable for a cook with average skill, imo, as opposed to some of the other ones out there. Btw, I made pho with a goat meat base using galangal, star anise, garlic, onion, and Ceylon cinnamon sticks. It was fantastic. The spices really complimented the strong taste of the meat. I cook with no added salt, instead using some form of acid, vinegar, lime juice, black vinegar, etc., to bring out the flavor. I've found that the black vinegar works the best for Asian foods. Unfortunately for most folks it's only available from an Asian grocer or from Amazon. Bad thing is Amazon charges 2 to 3 times the price of the grocer. 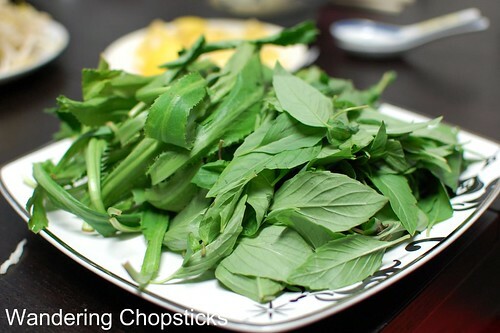 I've bookmarked your site and definitely plan to try a few of the Vietnamese recipes you have. Thanks again. There's no 5 spice or vinegar in pho. I only use black vinegar to dip dumplings and in hot and sour soup. It's used in Chinese cooking, not so common for Vietnamese food. Not sure what recipe you found that would have that. But the goat idea sounds fantastic. I like goat curry a lot so those spices sound great. Hello. 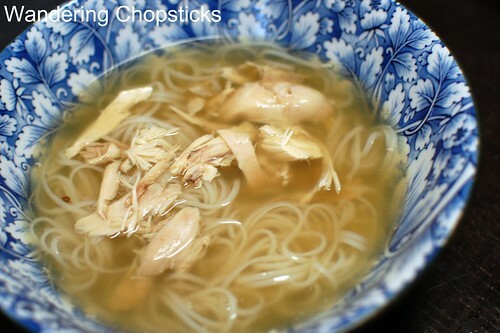 Is it possible to make Chicken Pho in the crock pot similar to your Crock Pot Beef Pho recipe? When cooking the chicken, it seems alot of the water would evaporate out through the entire process, do you add more, or does it not make much? Seems like alot of work to not get that much? Thanks! You can, but the chicken meat will be a bit mushier than tender via the Crock Pot. I should probably blog that recipe too. Some evaporation happens, but as long as you keep the heat at medium-low and the pot lightly covered (just enough to let steam escape), a 5-quart pot usually makes enough for about 4 to 6 servings. You can add more water, of course, but you'd have to add salt or fish sauce if that makes it the broth too bland. I made this for the first time tonight and it was a hit!!!! Thank you for such a great recipe!! My husband loved it. He said the flavor for perfect that he didn't use any sauce. I didn't want to tank for my first time so I chose chicken because it is cheaper. Next time I'm going to try beef pho! 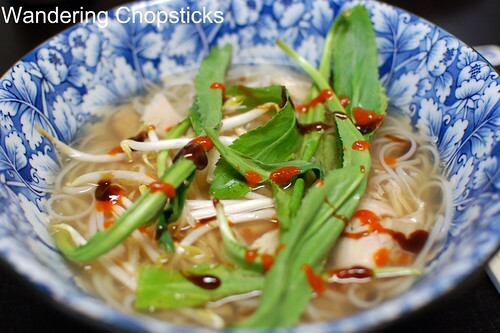 This is the ONLY site I use for Vietnamese recipes! Everything always comes out perfect and authentic. I've been coming here for YEARS. Thank you forever for this website. We are gearing up for blizzard here on the East Coast of USA. I'm going to make some Pho Ga so we can survive. I would make Pho Bo, but the grocery stores are crazy for this winter storm and I have to make do with what I have stocked in the house. BTW, Bun Bo Hue is my favorite! Aww. That's so sweet of you to say! I hope you weathered the storm safe and comfy with hot bowls of pho.